Little Gaijin in the Big City: Spring is here, Ahh-sa-pa-riiing is here~! Yay its warm outside! Cherry blossoms are blooming, birds are chirping, and I think it's time to poison some pigeons in the park. *^_~* Er, sorry. I mean, time to take millions of pictures! THat seems to be the thing to do, everyone else is doing it here. At sengawa station, there are some big lights set up under a cherry tree to make it glow brilliantly even at night. COntest time! 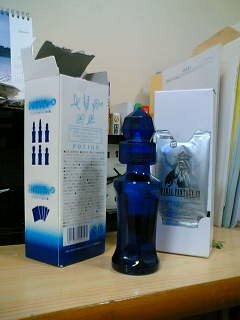 Whoever sends me an email first with one of the main characters of Final Fantasy 7, 8, 9, and 10 will get the bottle in the mail! hee hee. Second place will get a non-premium edition bottle (still cute though ^^). kyraweaver at hotmail dot com! Viet and Robin came and visited me last week! It was so fun. We went to the fish market and had some really fresh sushi, good times. Come visit, peeps! That must be a musician who it is hard to find fans of in Japan. Hostels! Anyway, I'm not sure if anyone else is considering such a thing, and I want to confirm that you don't have strong feelings about us all staying in the same hotel. But otherwise, I will be merrily staying in a hostel in Waikiki. wow, someone got the nerdy reference that's not my parents!! This confirms my suspicions ... my friends are all nerds. Yeah, another guest is planning to stay in a hostel! I should put up some links and phone numbers on the wedding blog, huh? good idea. I'll stay out of this latest contest because I poisoned it while I had it in my grasp.